Background: Ebola virus disease (EVD) is a highly contagious, life-threatening viral haemorrhagic fever, characterised by fever, vomiting, diarrhoea and haemorrhagic symptoms in <20% cases. Due to the scale, duration and the lethality of the disease outbreak in West Africa, it generated a high level of public fear and anxiety that resulted in misconceptions and malpractices in its prevention. Objective: The objective of the present study was to assess the knowledge, beliefs and malpractices regarding the prevention of EVD in a rural community of North-West Nigeria. Methods: This was a cross-sectional descriptive study was conducted as part of a field practical experience for final year medical students of Ahmadu Bello University, Zaria, from 6 to 31 October 2014. A structured, pre-tested interviewer-administered questionnaire was used to collect the data. The data were cleaned and analysed using Statistical Package for the Social Sciences for Windows, version 21.0. Results: Of the 574 respondents, 478 (83.3%) were farmers, whereas 304 (53.0%) did not have formal education. A total of 555 (96.7%) respondents have heard about EVD. Although 429 (74.7%) of the respondents knew fever was a symptom of EVD, 402 (70.0%) did not know that gastrointestinal bleeding was a symptom. A total of 134 (23.3%) bathed with or drank salt water as a preventive measure against the disease. There was a statistically significant association between the level of education and participation in salt-related malpractices for the prevention of EVD (P = 0.002). Conclusion: Although the level of awareness of the disease was very high, the level of knowledge of appropriate preventive measures was very poor in the community with negative beliefs, misconceptions and malpractices regarding prevention. There is a need to educate people in the community on correct preventive measures using two-way radio programmes to effectively control future outbreaks of EVD. Ebola virus disease (EVD) is a highly contagious, life-threatening viral haemorrhagic fever that is characterised by fever, vomiting, diarrhoea and haemorrhagic symptoms. These symptoms are found in <20% of the cases. It is caused by infection with Ebola virus which belongs to the family of Filoviridae. In humans, case fatality rate of EVD may be up to 90%. Ebola is transmitted to the human population through close contact with the blood, secretions, organs or other bodily fluids of infected animals. It is then spread in the community through human-to-human transmission, with infection resulting from direct contact with the blood, secretions, organs or other bodily fluids of infected people through broken skin or mucous membranes and indirect contact with the environment contaminated with such body fluids. Burial ceremonies in which mourners have direct contact with the infected body of the deceased person can also play a role in the transmission of Ebola. An outbreak EVD is a global health emergency that puts everybody and every nation at risk. The 2014 outbreak of EVD in West Africa affected several countries including Guinea, Liberia, Sierra Leone, Nigeria, Senegal and Mali. It started in December 2013 and ended on March 17 2016 when the World Health Organization (WHO) declared the end of the EVD flare-up in Sierra Leone after 42 days passed since the last Ebola patient tested negative. On 8th August, 2014, the WHO declared the Ebola epidemic to be a 'public health emergency of international concern'. During the outbreak, there were a total of 15,261 laboratory-confirmed cases and 11,325 deaths globally. In Nigeria, there were 19 laboratory-confirmed cases and a total of 8 deaths. There was however another outbreak in Liberia in April 2016, which ended in June 2016. EVD spreads easily in Africa because of inadequate infection control, health practices and burial ceremonies that expose people to infectious body fluids., Control of EVD has been difficult because the healthcare systems lack resources and expertise; many villages are remote, creating geographical barriers for access to proper care, treatment and infection control practices. Currently, there are no vaccines for preventing EVD. This means all efforts must be channelled to its prevention which is achievable through community awareness campaigns and health education, amongst others. However, misconceptions and malpractices are known barriers to effective prevention of the disease., The present study was therefore carried out to assess the knowledge, beliefs and malpractices regarding the prevention of EVD in Taban Sani, a rural community of North-West Nigeria. This prospective cross-sectional, community-based descriptive study was carried out in Taban Sani Community. Taban Sani Community is a rural settlement in Kudan Local Government area of Kaduna State, North-West Nigeria. From field census conducted, the community has a total population of 4,363; 654 households and 574 household heads. Most of the household heads are farmers. There are 1,062 women of reproductive age; 854 under-fives with a primary healthcare facility. There was no diagnosed case of EVD from the area throughout the outbreak in Nigeria. The participants comprised all the household heads in the community. It was, therefore, a total population study. Data were collected using a structured interviewer-administered questionnaire with closed- and open-ended question. The questionnaire was first prepared in English language and then translated into the local Hausa language and then translated back to English to check for consistency and phrasing of difficult concepts. The final year medical students who were involved in the community diagnosis used the questionnaire to collect the data. Information obtained included the respondents' age, marital status, level of education, occupation, knowledge of EVD, beliefs and practices for its prevention and the malpractices that took place in the community during the last epidemic of EVD in Nigeria. There were five questions each for both knowledge and beliefs with regard to EVD. The data obtained were cleaned and analysed using Statistical Package for the Social Sciences (SPSS) for Windows version 21.0 (IBM Corp, Armonk, NY). The results are presented in tabular format in which responses to questions were presented as proportions. Bivariate analysis was done using Chi-square test to assess the association between sociodemographic variables and involvement in malpractices to prevent EVD. Variables that were statistically significant in the bivariate analysis were included in multivariable analysis using logistic regression model. The level of statistical significance was set at a P < 0.05. Permission to conduct the study was sought from Kudan Local Government Area, Kaduna State, and appropriate entry permission was obtained from the leaders. An informed verbal consent to participate in the research was also obtained from each of the respondents. A total of 574 male respondents participated in the study. 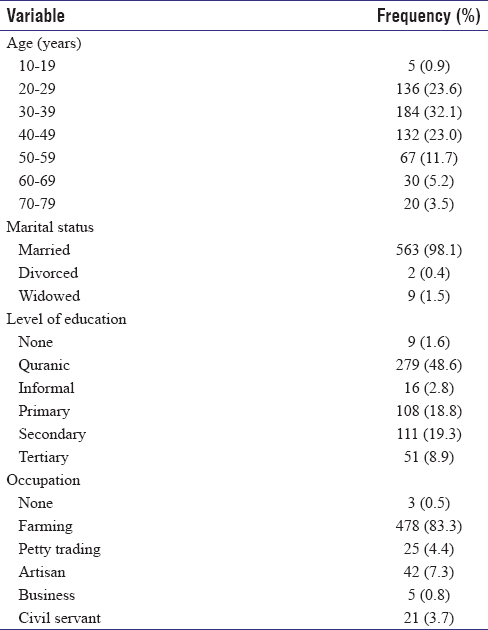 [Table 1] shows the distribution of the respondents in relation to age, marital status, levels of education and occupation. The age range of respondents was between 16 and 78 years while the mean age was 42 ± 6 years and the median age was 34 years. Four hundred and seventy-eight respondents (83.3%) were farmers, 42 (7.3%) were artisans, 25 (4.4%) were petty traders and 21 (3.7%) were civil servants. Five hundred and sixty-three (98.1%) respondents were married, whereas 270 (47.0%) had formal education, of whom 108 (18.8%) had primary education, 111 (19.3%) had secondary level education and 51 (8.9%) had tertiary education. [Table 2] shows the knowledge, beliefs and source of information for the respondents on EVD. Five hundred and fifty-five (96.7%) of the respondents were aware of EVD. Four hundred and twenty-nine (74.7%) of the respondents knew that fever was a symptom of the disease, whereas 401 (69.9%) did not know that gastrointestinal haemorrhage was a symptom. Radio was the source of information about EVD to 478 (83.3%) of the respondents, whereas only 26 (4.5%) heard about EVD from health workers. Only 57 (9.9%) of respondents had the correct knowledge of its incubation period of 2–21 days, whereas only 30 (5.2%) had correct knowledge of its causative agent. 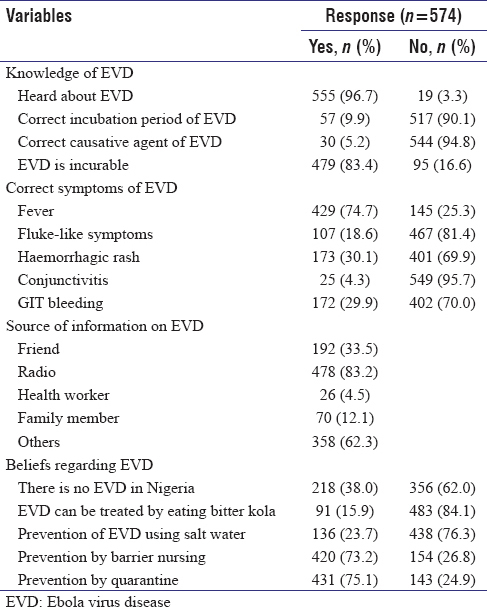 Two hundred and eighteen (38.0%) of the respondents believed that there was no EVD in Nigeria, whereas 91 (15.9%) believed it could be treated by eating Bitter Kola and 136 (23.7%) believed it can be prevented using salt water. Four hundred and twenty (73.2%) of the respondents believed that it can be prevented through barrier nursing, whereas 431 (75.1%) believed it can be prevented through quarantine. The different malpractices for the prevention of EVD amongst respondents are presented in [Table 3]. 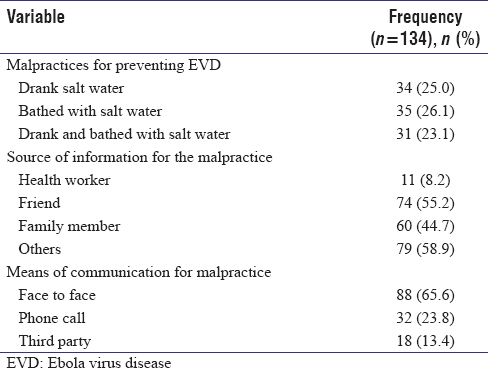 A total of 134 (23.3%) respondents participated in salt-related malpractices (bathing with salt or drinking salt water) in an attempt to prevent contracting EVD. [Table 3] shows that 34 (25.0%) of the 134 respondents drank salt water, 35 (26.1%) bathed with salt water, whereas 31 (23.1%) bathed with and drank salt water. Seventy-four (55.2%) of those that participated in the malpractices got their information about the malpractice from a friend, whereas 60 (44.8%) got it from a family member. Various media were used to communicate the need to engage in the various acts of malpractices to prevent contracting EVD. Eighty-eight (65.6%) of those who engaged in the malpractices received the message through face-to-face contact with a source, whereas 32 (23.8%) got the message through phone calls and 18 (13.4%) got it through a third party. [Table 4] presents results of bivariate and multivariable analysis of association between participation in malpractices and sociodemographic characteristics of respondents. It shows that at bivariate level, the only sociodemographic variable that was significantly associated with malpractices was level of education. There was a statistically significant association between level of education and participation in salt-related malpractices for the prevention of EVD (χ2 = 6.81; P = 0.002), with proportion of those that participated in malpractices decreasing with the level of education (from those with non-formal to those with formal education). Results of multivariable analysis show that amongst respondents with formal education, those with primary education were about 1.4 times more likely to engage in malpractice compared to those with Quranic/informal education with P = 0.012. 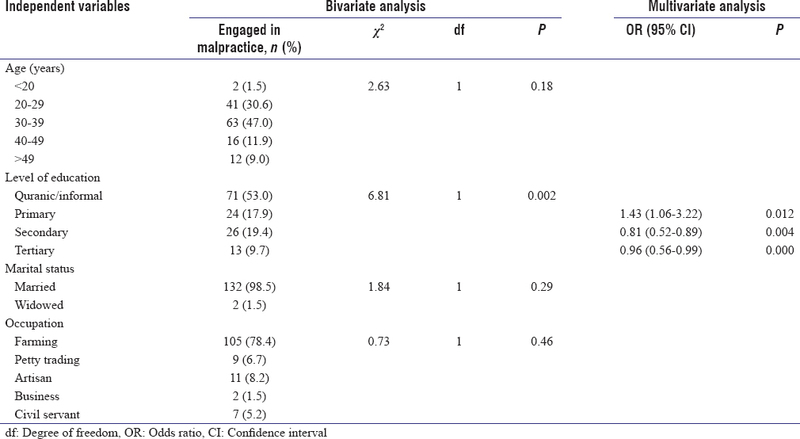 Those with secondary education were about 19% less likely to engage in malpractice compared to those with Quranic/informal education with P = 0.004. Those with tertiary education were about 4% less likely to engage in malpractice compared to those with Quranic/informal education with P < 0.001. Majority of the household heads were within the reproductive age group of 20–39 years. This is within the productive age group, and they can serve as agents of education and change in the community., Over half of the respondents did not formal education, with almost half of them having only Quranic education. A possible explanation for the lack of formal education amongst majority of the respondents was that there was low primary school enrolment in the Northern part of Nigeria in the past. For example, as of 1975–1976 when most of the respondents were of primary school age, the proportion of children enrolled in primary school in the North was just 26.5%, whereas between 1985 and 1986, it marginally increased to 34.3%. Close to 97% of the respondents were aware of EVD as an incurable disease. This finding was similar to finding in a study conducted in Zaria in 2015. Only a small proportion of the respondents in the present study, however, had knowledge of the incubation period of EVD. The finding in the present study was similar to the finding in a study in Kwara State, Nigeria, where only 35.5% of respondents had good knowledge of EVD. This suggests that poor knowledge of the disease is a common problem in other rural communities of North Nigeria and therefore, the need for community awareness campaigns in the region. The most common source of information about EVD was radio with a very few of the respondents receiving information from health workers. This was not surprising since in most of the local communities in Nigeria, radio is the most common source of information for so many issues. This is especially in the Northern part of the country. Less than 8% of the respondents received their information from healthcare workers. Healthcare workers are expected to provide more correct information and are more involved in disseminating information on EVD in the local community. In the present study, four out of ten of the respondents posited that there was no EVD in Nigeria and they had negative belief in the area of prevention by safe burial practices, quarantine of suspected cases and use of barrier nursing. There were also misconceptions about the use of bitter kola nut and salt water in the treatment and prevention of EVD. There is need to correct such misconceptions and misinformation in the community and the country at large to avert a future outbreak. Some of the misinformation and misconceptions such as drinking and bathing with salt water were translated into malpractices. About a quarter of the respondents participated in the harmful malpractices. Such misconceptions and malpractices were also documented in other African countries affected by EVD such as Guinea where 40% of the respondents believed that bathing with salt water prevents EVD, and in Sierra Leone, similar proportion of the respondent believed that bathing with salt water protects against contracting EVD. There are two possible explanations for the high rate of misconceptions and malpractices noted in the present study. First was the lack of formal education amongst in well over 50% of the respondents. Multivariate analysis showed that lack of formal education was a predictor of participation in malpractices for EVD prevention. It has been documented that formal education enables individuals to better understand the concept of disease, dangers associated with disease, susceptibility to disease and the need to take necessary preventive actions that are needed for maintenance of health and survival. It enables individuals to make the right decision regarding disease prevention and treatment. Enrolment into formal education (primary school) has increased by 64% following the introduction of free school meals in primary schools in Kaduna State, where the study area is located. A second possible explanation was that the scale, duration of the outbreak and the lethality of EVD in other West African countries generated a high level of public fear and anxiety which resulted in misconceptions and malpractices regarding the prevention of EVD. Addressing the misconceptions and malpractices is vital for the prevention of the disease in case of future outbreaks because studies from Guinea, a country affected by EVD, have shown that misconceptions and malpractices regarding prevention of the disease were a common barrier to efforts at prevention., The issue of misconceptions can be addressed using a two-prong approach: using both human resources in the form of community health workers (CHWs) and non-human resources such as phones and radio as a means of passing information to people in the community. CHWs have been successfully used for information dissemination during emergency situations. The only non-human communication method that was used in communicating the misconceptions was mobile phone which was the source of information to about a quarter of the respondents. The telephone is a two-way communicating media which is an advantage over the radio. On the other hand, the radio was the main source of correct information to well over 80% of respondents, but since it is a predominantly unidirectional medium, feedback from listeners is lacking. The radio can be used for clarifying misconceptions about EVD to many people at the same time. Findings in the present study may also apply to other rural, agrarian communities in the region. For effective control of future outbreaks, there is a need to make radio communication can be combined with phones to enable listeners to ask questions on EVD and receive responses on misconceptions. This will go a long way in dispelling misconceptions and averting malpractices which are known to prevent people from adopting correct preventive measures. This strategy is necessary since about 70% of Nigerians and in many developing countries, live in rural areas. Although nearly all the respondents were aware of EVD, only a very few people had the correct knowledge about EVD with negative beliefs, misconceptions and malpractices regarding prevention of the disease. For effective control of future outbreaks, there is a need for the community to be properly educated on EVD. The health education can be conducted using CHWs, phones, social media and radio, especially as two-way radio programmes. There also is a need to increase enrolment into formal education in the study area and other areas where enrolment formal is still low. The authors would like to thank all the study participants and the final year medical students for their support in the preparation and implementation of the study. We are grateful to the village head for permitting us to conduct the research and for his moral support. Centre for Disease Control 2014 Ebola Outbreak in West Africa – Case Counts. Available from: http://www.cdc.gov. [Last accessed on 2016 Jun 04]. World Health Organization. Six Months after the Ebola Outbreak was Declared: What Happens When a Deadly Virus Hits the Destitute? Available from: http://www.who.int. [Last accessed on 2014 Dec 12]. UNICEF. Misconceptions Fuel Ebola Outbreak in West Africa. Available from: http://www.unicef.org. [Last accessed on 2015 Jun 04]. World Health Organization. Ebola: Experimental Therapies and Rumoured Remedies. Available from: http://www.who.int. [Last accessed on 2016 May 02]. Kpanake L, Gossou K, Sorum PC, Mullet E. Misconceptions about Ebola virus disease among lay people in Guinea: Lessons for community education. J Public Health Policy 2016;37:160-72. Buli BG, Mayigane LN, Oketta JF, Soumouk A, Sandouno TE, Camara B, et al. Misconceptions about Ebola seriously affect the prevention efforts: KAP related to Ebola prevention and treatment in Kouroussa Prefecture, Guinea. Pan Afr Med J 2015;22 Suppl 1:11. World Health Organization. Bursting the Myths about Ebola is Crucial to Stop the Transmission of the Disease in Guinea. Available from: http://www.who.int. [Last accessed on 2016 May 02]. World Health Organization. Factors that Contributed to Undetected Spread of the Ebola Virus and Impeded Rapid Containment. Available from: http://www.who.int. [Last accessed on 2016 May 02]. Alexander KA, Sanderson CE, Marathe M, Lewis BL, Rivers CM, Shaman J, et al. What factors might have led to the emergence of Ebola in West Africa? PLoS Negl Trop Dis 2015;9:e0003652. Emory Healthcare. Ebola Preparedness Protocols; 2014. Available from: http://www.emoryhealthcare.org/. [Last accessed on 2015 Jan 20]. Gardner M. Youth as Knowledge Constructors and Agents of Educational Change. Available from: http://www.mun.ca. [Last accessed on 2015 Jan 20]. Skirbekk V. Age and Individual Productivity: A Literature Survey. Available from: http://www.demorg.mpg.de. [Last accessed on 2015 Jan 20]. Yakubu AM. Western Education in the Northern Nigeria: Challenges and Strategies. 1st ed. Zaria, Nigeria: Published by National Gamji Memorial Club; 1996. p. 32. Rahman K. Emergency Preparedness of the Health Centre of Federal College of Education Zaria-Nigeria to Manage Ebola Virus Disease Outbreak. A MSc Thesis Submitted to Post Graduate School, Ahmadu Bello University, Zaria, Nigeria; April, 2015. Anwar H. Community participation in disaster management: Role of social work to enhance participation. Online J Anthropol 2013;9:2880. Focus 1000 – Technical Report. Study on Public Knowledge, Attitudes, and Practices Relating to Ebola Virus Disease (EVD) Prevention and Medical Care in Sierra Leone; 2014. Available from: http://www.newswire.crs.org. [Last accessed on 2015 Jan 20]. Aslam M, Kingdon G. Parental Education and Child Health – Understanding the Pathways of Impact in Pakistan. Available from: http://www.ideas.repec.org. [Last accessed on 2015 Jan 12]. Critical Times. Kaduna Government Introduced Free Meal for Primary Schools. Available from: http://www.criticaltimesnews.com. [Last accessed on 2016 Jan 22]. Adeloye VS. Satellite technology in rural communication systems. Bull Sci Assoc Niger 2007;28:91-6.